My limited novella An Ideal Retreat sold out earlier this year at Dim Shores, but Publisher Sam found a few extra copies. An Ideal Retreat is available for sale again, while they last. It’s a beautiful book, with art by Mikio Murakami. Also, if you’re shopping at Dim Shores, don’t miss out on Looming Low, their beautiful first anthology. Also, while you’re there, take a look at the latest from Dim Shores, The Resplendent Troswoman Below, by Joseph S. Pulver Sr. and Edward Morris. This release is a fundraiser to our good friend Joe Pulver, who has experienced a terrible health episode recently, necessitating a lengthy hospital stay, and followed by a slow recovery. All proceeds from sales of the chapbook will go directly to benefit Joe. Dim Shores consistently does great work, and since most of their books are limited, you’ll want to check out these listings ASAP if you’re interested. I recently previewed the beautiful cover art by Yves Tourigny for the trade edition of Looming Low, to be published this summer by Dim Shores. This week, Sam from Dim Shores offered a peek at the alternate cover artwork that will be featured on the limited hardcover version. This wonderful art is by Marcela Bolivar. I love the idea of very different artwork variations for different formats of the book, similar to what Word Horde did with The Children of Old Leech, with a hardcover art by Matthew Revert and paperback art by Dalton Rose. The book is meant to be out this summer, with an official launch at NecronomiCon in Providence in August, and it appears the plan is that both trade paperback and limited hardcover will be available at that time, as well as through the Dim Shores online store. The paperback version will be available through other outlets such as Amazon, Barnes and Noble, and so on. More information about the project, including a listing of all the writers and their stories, can be found at Sam Cowan’s blog HERE. Dim Shores, the excellent small publisher responsible for my own An Ideal Retreat last year, has released quite an impressive series of limited edition paperbacks. Not long ago, Sam Cowan announced Looming Low, the first Dim Shores anthology, which he planned to co-edit with Justin Steele. The book will be released this summer in a limited hardcover, and an unlimited trade paperback, and the editors have just offered a preview of the cover. The cover art is by Yves Tourigny, and I think it looks fantastic! Here’s the full wraparound design, the back cover of which includes the roster of authors. You can click on the image to see it bigger. 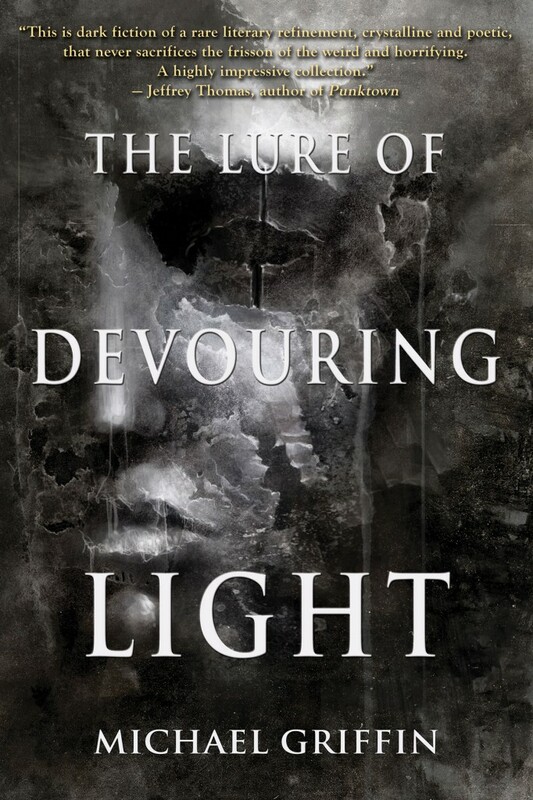 I’m very excited about this book, which will include my novelette “The Sound of Black Dissects the Sun,” along with a lot of really great-sounding stories by some of the best names in the Weird & Horror fiction scenes. I mentioned the limited hardcover, which will utilize different art by another artist. I look forward to seeing and sharing that as well, when it’s available. Great work by Sam, Justin and Yves so far. My limited edition novella An Ideal Retreat, from Dim Shores, sold out over the weekend. I’d like to thank everyone who picked up a copy! This illustrated edition of 200 numbered copies was a wonderful thing, well-designed by Sam Cowan and with wonderful artwork inside and on the cover by Mikio Murakami. If you missed it, there may be a few copies set aside for sale at NecronomiCon in Providence this August. Beyond that, the novella should be included in my next collection, planned for some time in 2018. It makes my day to see such a wonderful review of AN IDEAL RETREAT by one of my favorite writers. Yes! This is fiction for grownups who know the meaning of compromise and sacrifice. This is writing for people who have made mistakes and survived. Highly recommended. As of early this morning, I’m told Dim Shores only has 5 copies remaining of the edition of 200, so if S.P.’s review has convinced you, I’d hurry up and grab a copy. Let’s make it three separate Looming Low posts today, then. Here’s the table of contents, in alphabetical order by author name, courtesy of Dim Shores Editor/Publisher Sam Cowan and Editor Justin Steele. I promise, this is the post for today about this book. I mean, unless they reveal the cover, of course! The project is already receiving a ton of enthusiastic buzz today. Can’t wait for the next batch of information, and the cover reveal! I’m really excited to be part of the first Dim Shores anthology, especially alongside such a great roster of writers. Just received news that my novelette “The Sound of Black Dissects the Sun” will be part of Looming Low, the first Dim Shores anthology, edited by Sam Cowan and Justin Steele. The rest of the lineup I’ve seen so far, writers making their own announcements on Facebook and Twitter, looks amazing. I’ll have more news about this soon, including a full table of contents. I’m very excited to be part of what looks to be a great book, and thank Sam and Justin for the opportunity.